On November 9th, 2017, an exhibition opened for the first time, which deals exclusively with the history of the Jews in Koenigsberg. From the perspective of the inhabitants at the time, it tells the story of Koenigsberg at the end of the 19th century, at the time of the construction of the New Synagogue, which had its place not far from the Koenigsberg Cathedral (Dome), and where now a synagogue for the Jewish citizens of Kaliningrad is in construction. 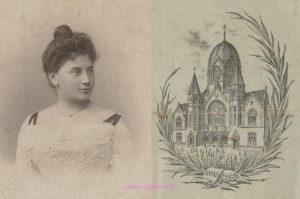 The catalog includes various topics such as ways of life, family life, the influx of new Jewish citizens, economy, donation culture, health tourism, Zionism, student life, summer freshness in Cranz and many details about the synagogue. From 2017 Nov 9 till Dec 10 the exhibition took place in today’s History and Art Museum of the region Kaliningrad, in the building of the former “Stadthalle”. 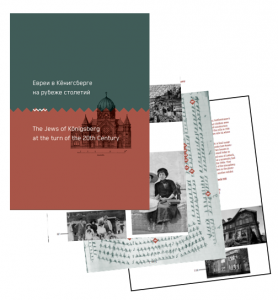 The non-profit association Jews in East Prussia (Juden in Ostpreussen, Kultur und Geschichtsverein eV) has been researching the exhibition theme since its foundation in 2004. Since 2015, the project of the exhibition in Kaliningrad has been intensively worked on. It took many journeys to research with today’s descendants and for work stays in archives. For the realization and production of the exhibition and the catalog, considerable costs arose, for which the association has not received any subsidies from any institutions. Therefore, we are looking forward to donations to support this work. Offer valid as long as published at the web site.